Tagged with China, Engineering, MoU, Northern Ireland, Wuxi. 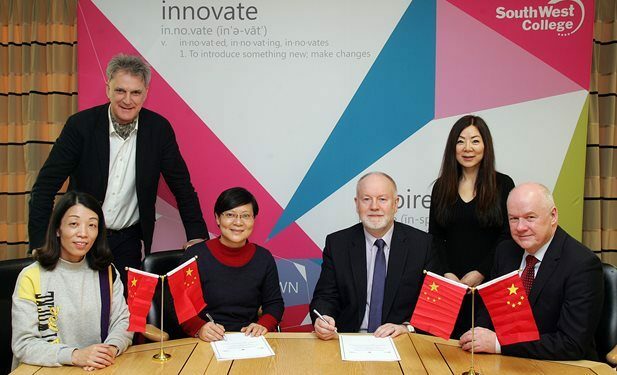 Northern Ireland’s South West College has signed a Memorandum of Understanding with China’s Wuxi Vocational and Technical Higher Diploma School of Automotive Engineering as part of its growing international education strategy. The partnership will enable both institutions to work together to develop courses for the automotive industry, as well as benefiting the wider industry by helping to address the global skills shortage. South West College is well known for its pioneering approach to automotive engineering across the education sector, and chief executive Michael McAlister said they are delighted to partner with Wuxi School to further strengthen the college’s curriculum in this area. “Wuxi School has an exceptional reputation in China having forged a close partnership with the BMW Group and the Chinese Ministry of Education,” he said. “The school is also [helping] to carry out the development of a pilot project of modern apprenticeship to train highly-skilled personnel in automotive technology and we are delighted to be a part of this partnership,”McAlister added. The main objective of the partnership is to improve the mutual understanding and delivery of world-class professional education and training in automotive industry skills through joint initiatives. It will also enable the partners to benefit from collaboration on curriculum design with the specific aim of developing a ‘sandwich’ program at Level 4, enabling Chinese students to study for a year in the UK.